Homegrown, all-natural, beauty brand Herbline Essentials has a moisturiser for you, whatever your skin type! We may have spent our teens and early twenties, slathering on whatever lotion we happened to find in our bathroom cabinet, but these days we know the importance of investing in a moisturiser that will do more than just hydrate parched skin. Your daily face cream should work for your specific skin type, to remedy anything from complicated, combination skin to pesky hyperpigmentation. So, instead of slapping on another cream without a thought, award winning UAE all-natural skincare brand, Herbline Essentials are here to help, with a moisturiser to work with whatever your skin type or concerns. A greasy T-zone may make you want to skimp on the moisturiser, but the right formula can keep shine in check. Herbline Essentials Hydra-5 Gel (AED 129) is made from 95% Aloe Vera juice, and provides deep moisturising action, with NO added oils or waxes commonly found in similar gels. Hydra 5 ensures protection against pollution, dirt and dryness and is also a soothing after-sun gel. In addition, it can be used effectively for oily/problematic or combination skin, or to calm skin after waxing or shaving. Enriched with honey and apricot oil, Herbline Essentials powerful Nourishing Cream (AED 141) works by increasing the skin’s resilience to moisture, leaving it smoother, softer and more hydrated than ever before. With inherent SPF properties within its ingredients and the cleansing and hydrating properties of Aloe Vera and vitamin E, this nourishing cream works to detoxify and heal whilst leaving the skin beautifully moisturised, with not a patch of dryness in sight! Herbline Essentials Firm Skin Cream (AED 179) is a unique, powerful cell stimulator that works by soothing away wrinkles and dark patches leaving your skin firm, supple and younger looking. The highly effective blend of herbs, including nutmeg, cloves, citrus oil and coriander seed oils are high in antioxidants and work to detoxify the skin with their strong antiseptic properties. Enriched with coco palm wax and sunflower oil, the base cream helps to retain the water in the skin, hydrating and restoring the skin’s natural elasticity. Massage it into your skin and literally watch the years and the wrinkles roll away! Specially designed for sensitive and easily irritated skin, Herbline Essentials Skin Protection & Healing Cream (AED 119) is packed with Aloe Vera gel, Zinc Oxide and Lactic Acid and acts as an antiseptic, a sun block and a moisturiser. This unique, completely natural formulation helps protect the skin from pollution, wind, UV radiation, heat, sun and snow burns. Deeply nourishing, it transforms the look and feel of dehydrated, irritated and flaky skin. It can also be applied to minor rashes and redness on the face and body, including nappy rash to sooth and heal the skin, gently and effectively. There’s nothing more aggravating than dark, uneven spots on the skin caused by acne, aging, or the sun. Luckily, Herbline Essentials Fairness Cream (AED 139), is a powerful formulation that helps protect the skin from the sun, wind and heat whilst it naturally lightens the complexion. Its’ unique formulation works to prevent scarring due to acne and reduces pigmentation patches. This effective blend contains liquorice root extract, known to be an effective antioxidant and skin lightener, whilst Aloe Vera works to heal and hydrate the delicate layers of the skin. Herbline Essentials is the home grown beauty brand and one of the UAE’s top selling pharmacy skin and hair care ranges. Its products use completely 100% organic ingredients and are paraben, paraffin and cruelty-free. Review : January 2015 Glambox! 1) A Thousand Wishes fragrance mist from Bath & Body Works – This fragrance mist comes in a gorgeous travel sized bottle. It’s Velvet musk scent is very fresh and nice. However, like any other B & BW fragrance mist, there is an alcoholic scent that is overpowering immediately after you spray it. It fades away immediately but after a few minutes, the scent of the mist fades away too. It has no staying power at all. The bottle contains 88ml and is worth AED35. 2) Revivogen Bio Cleansing Shampoo – It’s my first time trying this brand. This is my favorite product of this box. It has a distinct herbal scent which lasts for a long time on your hair after you use it. My hair felt great after using it. It gives a very fresh, healthy and clean feel. It has a thick consistency. This specially designed shampoo contains essential bioactive nutrients that nourish, moisturize and improve the hair and scalp condition, thus creating a healthy environment for hair growth. The sample bottle contains 60ml. It’s full size version (360ml) is priced at AED 90. 3) Palmer’s Cocoa butter formula – This is a thick body lotion that I already love. I am glad I received this. It’s great for carrying in your purse. It really hydrates the skin and contains Vitamin E in it. The sample bottle contains 50ml. It’s full size version (250ml) costs AED 22. 4) Herbline Essentials Sunscreen lotion with SPF 40 – This little sachet of sun screen lotion contains 5 ml and is parabens and paraffin free. I haven’t used it yet. 5) CHI silk infusion – This is a leave in treatment that helps to protect hair from mechanical and environmental damage with pure natural silk, wheat and soy proteins. It adds an incredible shine for all hair types whilst giving you softer, smoother hair. It has a beautiful scent and texture. It’s non sticky and looks like a serum. I am loving it!. The sample bottle contains 15ml. It’s full size version is priced at AED 195. There are four vouchers this time and if you are someone who would use it, this box will become very much worth your money! 4) A coupon code worth AED 75 to spend on www.thehotboxkit.com, which sells stylish yoga, dance, workout wears. Overall, I cannot say I am immensely pleased with the selection of products in this box but still I am glad I got to try out two brands, Revivogen and Chi, for the first time. That is the very purpose of Glambox, to introduce new brands to you!. These two products, in fact, turned out to be my favorites out of all the products in this box. Did you receive this box?. What are your thoughts about it?. New Year Skin Resolutions With Herbline Essentials! Welcome to 2015 – a brand New Year that’s filled with so many new opportunities and the chance to break bad beauty habits and start again afresh. So, if you’re sleeping with your make-up on, forgetting to apply SPF when out and about, or not drinking enough water to keep yourself hydrated, now is the time to make some positive steps to change and up the ante on your beauty routine in the year ahead. 1. Stop sleeping in your make-up! How many times do we vow to do this? Well, all the time probably, until we don’t have the energy to walk to the bathroom and wash our faces! We understand the days get busy, but simply put, if you have time to put make-up on, you need to make time to take it off. Sleeping in make-up, not only marks your lovely bed linen, but it’s the perfect breeding ground for bacteria too. Instead of falling asleep in your foundation, think about how you can re-order your life to incorporate a better cleansing routine. If you doze off in front of the TV every night, clean your face before you turn it on. Do you hate washing your face in the sink, then take a shower and wash it then. Herbline Product recommendation: Aloe Vera and Honey Cleansing Milk (AED 99) – The Aloe Vera acts as a natural cleanser, while the honey penetrates deeply to nourish the skin. The formula works effectively on make-up and dirt, unclogging pores and moisturing the skin at the same time. 2. Cleanse, tone and moisturise – embrace the importance of a good routine! Clean, healthy skin is always on trend and embracing the three-step skincare routine really does work, so take the time to choose and invest in some good products that will cleanse, tone and moisturise your skin. It will thank you for it in the long run. Herbline Product recommendation: Hero product, the Cucumber & Rose Skin Tonic (AED 105) cools and softens your skin. This tonic is blended with a natural moisturiser and mild astringent that will soothe and tone, leaving your skin moist, supple and beautifully fresh. It is especially good after shaving and waxing too. How many of us happily moisturise our face, but forget all about the rest of the skin on our bodies?. Moisturise your whole body every day, using a lotion, body butter or one of the new moisturising sprays. It’s important to replenish your skin’s lost moisture, especially in this colder season. Also, don’t forget to body brush your body once a week, to kick start healthy blood circulation. Herbline Product recommendation: Aloe Vera and Honey Moisturising Lotion (AED 99) – combining the moisture rich properties of Aloe Vera with nutritive honey, this delicious moisturiser works as a light, yet powerful, detoxifying and healing lotion. As it hydrates, the skin is transformed, becoming smoother and more supple. 4. Don’t forget your SPF! Sunscreen isn’t just for when you hit the beach. Never forget the importance of protecting your skin from the sun, especially here in the harsh desert environment, as you go about your day-to-day life. On a daily basis, the sun’s UV rays can affect our skin more than we realise. Long-term, regular exposure to the sun can decrease the elasticity of our skin, resulting in premature aging, while too much sun can also decrease our skin’s immune function, making us more susceptible to cancerous cells. Herbline Product recommendation: SPF 40 Sun Screen Lotion (AED 109) is fast absorbing and protects your skin from wind, sun exposure and heat, whilst gently moisturising. Suitable for all ages and skin types, this lotion can help to heal minor rashes and sunburn. Just don’t forget to re-apply it every 2 hours or after swimming. While eight hours of sleep might not be for everybody, you know better than anybody just how much sleep your body actually needs. It’s just so easy to try and get by on less than that, isn’t it? Here’s the thing though: your skin, (like the rest of your body), regenerates and repairs as you sleep. This means that getting adequate sleep will do wonders for your complexion and your overall health. Herbline Product recommendation: Try Herbline’s wonder cream, the Aloe Vera, Apricot & Sunflower Nourishing Cream (AED 141). The powerful Nourishing Cream works by increasing your skin’s resilience to moisture, leaving it soft and completely hydrated. It contains natural ingredients that have SPF properties according to the study of Ayurveda and will detoxify and heal. Pair a good night’s sleep with this replenishing moisturizer and wake up to renewed and replenished skin. Keep your New Year skin resolutions. Keep your skin beautiful with Herbline Essentials. Herbline Essentials is the home grown beauty brand and one of the UAE’s top selling pharmacy skin and hair care ranges. Its products use completely 100% organic ingredients and are family friendly. Safa received a Pore Cleanser, the Skin Protection and Healing cream, which is one of Herbline Essential’s latest products and finally Henna & Liquorice shampoo & conditioner. The gift hamper is worth about AED300. She also has left a Thank you note for me in the pic. So lovely of her. I hope she enjoys these top quality products by Herbline Essentials. Fatema shared a picture of all the products in her hamper, on her Facebook page. Sweet of her to do so! This picture really put a smile on my face :). How cute and creative it is!!. Sarah is one of my favorite bloggers and am glad that she was one of the random winners in this giveaway. She received a gift hamper containing 7 masks! When Glambox agreed to sponsor a box, they hadn’t promised any particular month’s box. So, I myself was delighted for the winner, when she received the much raved about November FaceShop Glambox where Glambox teamed up with The Face Shop to create Glambox’s first ‘All natural Green box’ and offered subscribers some really amazing products!. Perfect for winter :). Sarita left me a thank you note too! Herbline Essentials helps you maintain your mane! With Henna & Liquorice Shampoo & Conditioner for hair fall, Herbline Essentials helps you maintain your mane! Hair fall is a big problem in the UAE. Many attribute this to the treated water that is used in the region, while others blame it on factors of pollution and the extreme weather throughout the year. There are other internal factors too that can also play a very integral role in increased hair fall, such as stress, lack of exercise, unhealthy diet and dehydration. Although many of the factors are external and we can do little to change them, there are a few preventive measures that can be undertaken by individuals to ensure that severe hair fall is treated. Massage coconut oil or olive oil into your scalp gently. Leave it on for half an hour and then proceed to wash and shampoo your hair. This will provide the scalp with the necessary nourishment it needs and also help your hair grow stronger. Henna has traditionally been used as a natural hair conditioner. Now, blended with other complementary and beneficial ingredients, leadwort, liquorice and hemidesmus indicus, this shampoo and conditioner duo leaves the hair smooth, shiny and tangle free. The duo promotes hair growth, whilst strengthening and safe guarding against hair loss. Since these products are 100% organic, you are also saving your hair from exposure to harsh chemicals that can worsen the condition. Maintaining a healthy diet is crucial to prevent hair loss. Try increasing your intake of Omega 3 fatty acids naturally by eating more fish like salmon and mackerel and incorporating more nuts and seeds into your diet. Never leave the house with your hair exposed. If your job requires you to be exposed to direct sunlight for long hours, make sure you always keep a hat or a scarf on hand to cover your hair. Minimizing exposure to the sun makes sure that the hair remains in a healthy condition as exposure to heat always damages the cuticle of the hair leaving it more prone to fall. Heat is a major contributing factor when it comes to hair fall. In fact, a simple blow dry at the salon contributes significantly to hair fall. As often a possible, try styling your hair using heat free methods. There are multiple styles for the various lengths of hair that look amazing without using any or much heat, so why not try those out for a change! Herbline Essentials Henna & Liquorice Shampoo retails for AED 99 and the conditioner AED 79. To find out more details about Herbline Essentials or to purchase your own Henna & Liquorice Shampoo and Conditioner visit leading pharmacies across the UAE and Kuwait, or www.herbline-essentials.com. You can also visit Herbline Essentials’ Facebook page https://www.facebook.com/Herbline.Essentials for daily updates on health, skincare and organic beauty. 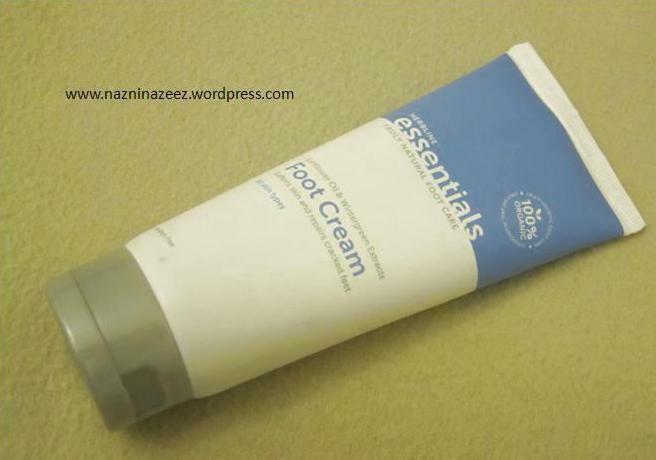 Review : Herbline Essentials Foot cream! I have tried several creams to better the condition of my feet. Most of them had temporary effects only. My feet would look moisturized for couple of hours and then, bam!… Am back to square one!. I have tried regular body lotion and even foot creams by brands that deal with only foot care products, which means they specialize in it. 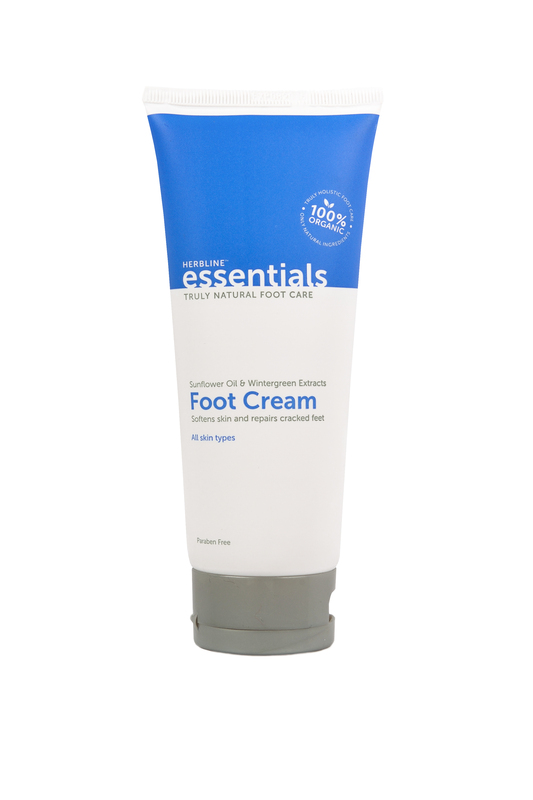 But nothing gave me lasting results until I tried the brand new foot cream by Herbline Essentials!. It’s an absolutely stunning product!. Within a week of using it, my feet were transformed. The dryness is completely gone. My mom who usually scrutinizes me from top to bottom whenever she meets me, was pleasantly surprised at my feet’s transformation. She remarked “I don’t know what you are doing to your feet, but whatever it is, continue doing it” :P.. I then revealed my ‘secret’ to her :D. I have been using this for almost 2 months now.. The product comes in a tube, which is very handy and convenient to use. The cream is white in color and slightly thick in consistency. It is a heavy duty cream, yet gets absorbed easily. I suggest you apply it to washed and dried feet. At first, I felt it will be better to apply to slightly damp feet. However, no that’s not a good idea. It combines with water and becomes pasty, thus being tough to get absorbed. The first thing I noticed about it, is it’s smell. It’s a soothing menthol smell. It contains mint extract, which gives that menthol scent. The other ingredients in it are Spring Water, Coco palm wax, Mineral oil, Sunflower oil, Bees wax, Glycerol and more. One of the main ingredients is Wintergreen extract, which improves the effects of aging, tightening the skin and alleviating the pain in the muscle tissues. This product is paraben free. Price : AED 52 for a 150 ml tube. You can purchase it at all local leading pharmacies like Boots, Bin Sina, Health First and United Pharmacies, including the Dubai Duty Free pharmacies at Dubai International Airport. It’s also available online. Click here to check out the direct link to this product. They ship worldwide. In UAE, it’s shipped for free. Flawless Feet With Herbline Essentials! Our feet need nourishing and protecting in the heat of the desert. What’s more, the fact that they’re constantly on show in sandals and flip-flops is an added incentive to make sure we are taking great care of our tips and toes. Herbline Essentials, the all natural Ayurvedic skin and hair care brand is homegrown here in the UAE. Its Foot Scrub (AED 49) and Foot Cream (AED 52) use entirely organic ingredients for ultimate care and protection for your feet. Organic products are on the rise, and Herbline Essentials’ complete holistic approach has gained the trust of consumers all over the world. 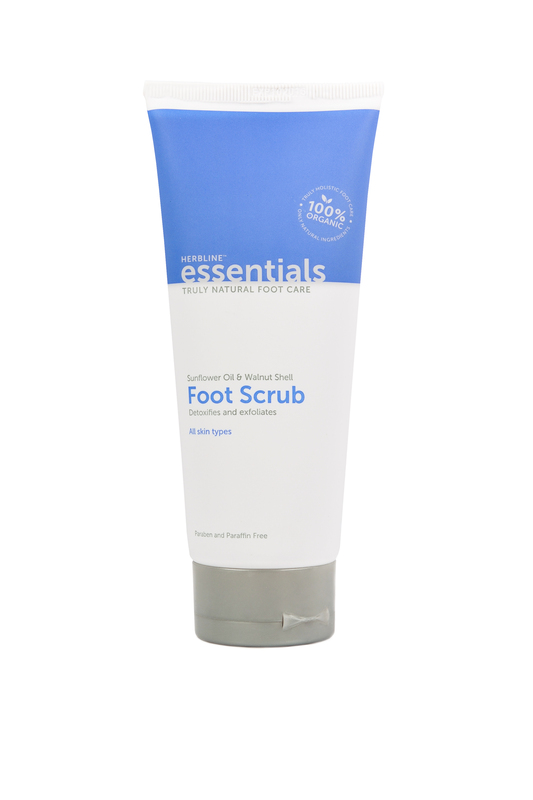 The Foot Scrub is a unique blend of absorbent clays that are combined to detoxify and exfoliate your feet, cleaning and soaking away dirt and leaving them soft and clean. With additional extracts of oil of wintergreen, the Foot Scrub will also relax and reduce your feet’s fatigue. Natural ingredients also include spring water, clay, coco palm wax, sunflower oil, and walnut shell. After a vigorous scrub, enjoy the cooling Foot Cream. Using a nourishing blend of oils, waxes and natural extracts, this cream repairs tired and cracked feet, leaving them perfectly soft and flip-flop friendly. The powerful wintergreen extract provides extra astringent benefits, alleviates muscle pain and helps to improve signs of aging by tightening the skin. The brand new tube design of the Foot Scrub and the Foot Cream means you can carry it in a small handbag or the zipper of your beach bag. Both foot products are paraben, paraffin and cruelty-free, making Herbline Essentials the ideal choice for savvy consumers who are making purchases with an ethical conscience. To find out more about Herbline Essentials’ all-natural approach to beauty and its products, visit www.herbline-essentials.com. 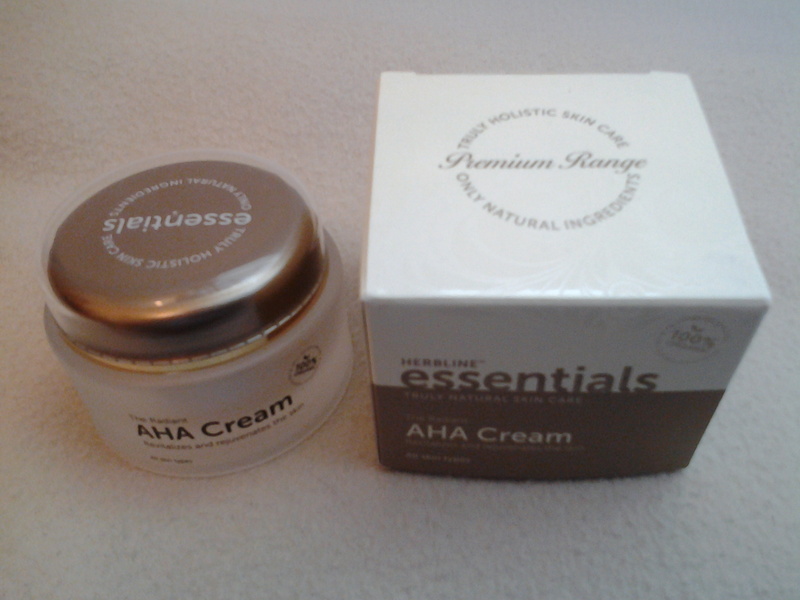 Review: Herbline Essentials AHA cream! 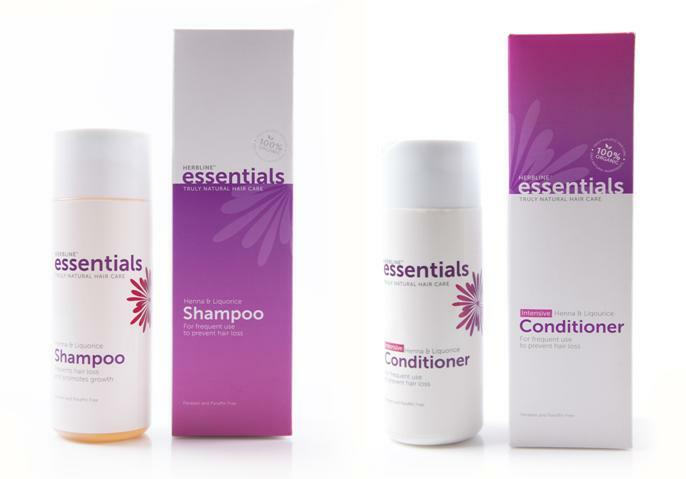 Herbline Essentials recently launched a luxury range, a few months ago, called Premium Essentials. 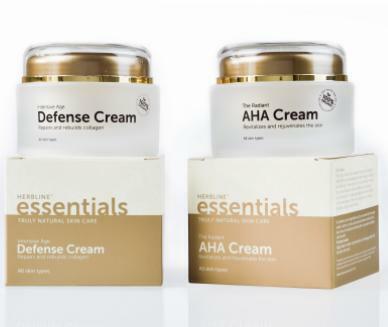 This range currently consists of two products: Intensive Age Defense Cream and AHA Cream. 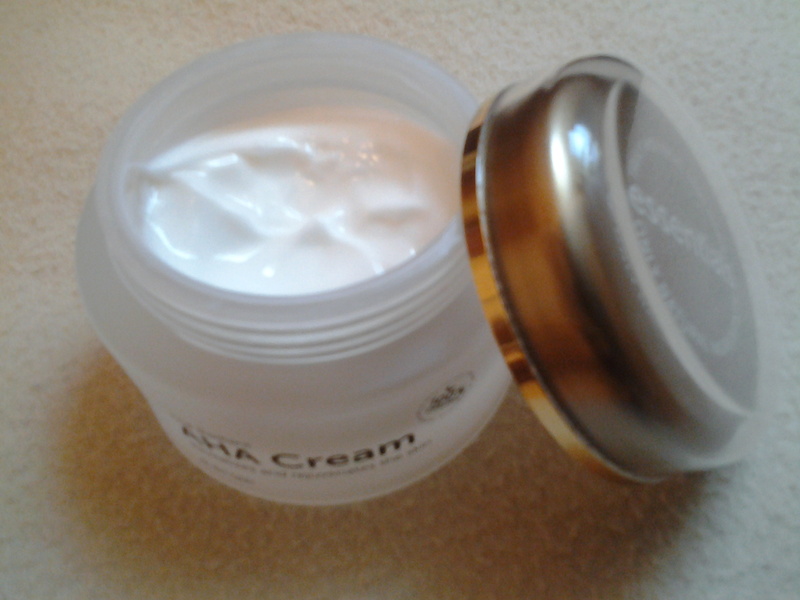 Today my review is that of the AHA Cream. However, before that I would like to talk a bit about AHA. It stands for Alpha Hydroxy Acids, which are typically derived from food products including glycolic acid (from sugar cane), lactic acid (from sour milk), malic acid (from apples), citric acid (from citrus fruits) and tartaric acid (from grape wine). You will mostly find Glycolic and Lactic acids in creams/peels because of their greater power to penetrate the skin. AHA helps in fighting skin aging, by helping along the production of collagen that keeps your skin firm, elastic and youthful. It helps to shed the dull layer of dead skin cells (the very top layer of your skin) and thus gives you a glowing look. AHAs in cosmetic products, come at different concentration of active ingredients. Usually, at-home peel kits/creams have a concentration of less than 5%. For intensive effect on scarred/acne prone skin/mature and photo-damaged skin, there are chemical peels done strictly by professionals, in which the concentration can go as high as 50 – 70%. The usage of AHAs is not advised in the mornings as your freshly revealed skin is more prone to sun damage. Herbline Essential’s AHA Cream has a concentration of 2 – 3 % and is recommended for all skin types. It specifically says here on the packaging that it can be used daily and only at nights. This cream boasts a myriad of great, organic ingredients like : Coco palm wax, Castor oil, Rice bran oil, Grape seed oil, Wheat germ oil, Coconut oil, Apricot kernel oil, AHA, Shea butter, Lactic acid, Jojoba oil, Almond oil, Calendula oil, Sunflower oil, Green tea extracts, Aloe Vera gel to name a few!. Some might be allergic to certain herb extracts and as such I would suggest a patch test before you try this product. I did a 24 hours patch test and it went just fine. When using products with active ingredients, it’s best to use it as the first product on the skin to aid better penetration. So, I first use a cleanser, then a toner and then the AHA cream and then continue with the rest of my routine. I will talk in detail about how to layer different skincare products in an upcoming post. The cream is white in color, thick, yet gets absorbed super fast into your skin. You don’t need a lot at one time. I have been using this cream daily, for the past two months and I have used up only 1/4th of the product!. It says on the packaging, that it should be massaged gently onto dry face and neck. This is of utmost importance because if you apply this to a wet face, it combines with the water, becomes paste-like and makes absorption really tough. You will then need to keep massaging, to get it absorbed. But on a dry face, it works like a charm. You get a radiant look almost immediately. Your skin also gets a firm, smooth, soft and supple feel. I just love it! The product comes in a glass jar, containing 50 gms. It has a white lid inside to keep the cream from smearing all over the main lid, which is golden in color. It’s smell is pleasant, though it doesn’t smell like any of the individual natural ingredients listed. It might be the smell of the lactic acid/AHA. This product, being a luxury item with all the natural, organic goodness in it, costs a whopping AED342. If you can afford it, I would totally ask you to invest in this cream as it helps even out your skin and regular use helps break the bonds that hold dry and damaged cells together leading to healthy and fresh skin!. You can buy this, along with other amazing Herbline Essentials products, from all leading pharmacies in UAE like Boots, Bin Sina and also from their online store. There is no shipping charge within UAE, which is a great deal!. To check out the AHA cream on their site, click here. Have you ever used an AHA cream?. If yes, what are your thoughts on it?. Do leave a comment below. Don’t forget to take part in my ongoing Hello Summer Giveaway Hop, to win a giftcode worth $75 to spend at Minted.com. Giveaway ends on 28th May 2014 and is open to international participants!